Since I started painting in miniature a few of years ago, I have been amazed by the wonderful response my miniature Art In Wax pictures have had. 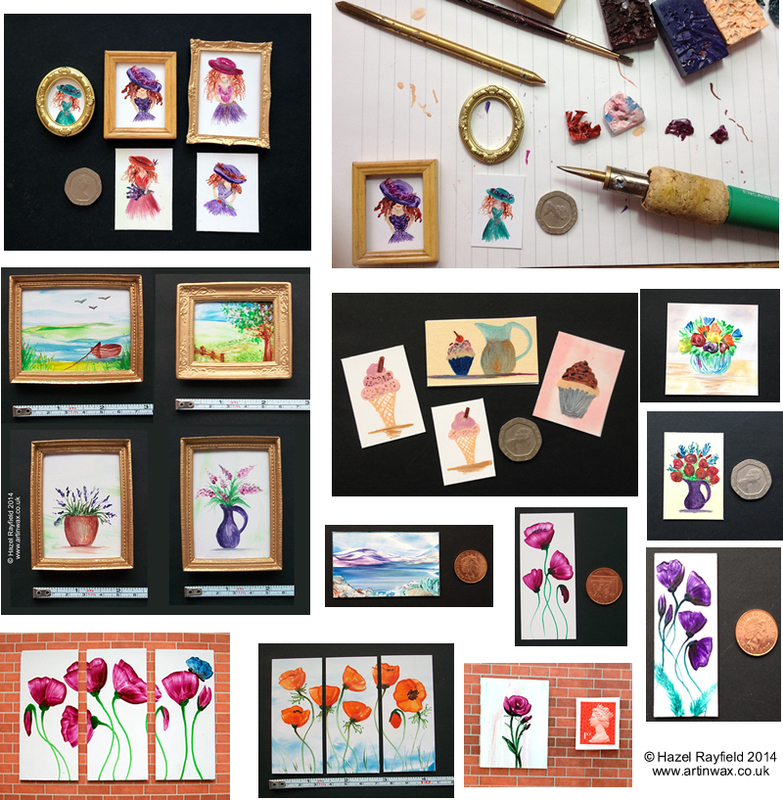 I have sold many pictures from Art Card Editions and Originals (ACEO) to small and tiny Dolls House style art, in fact there are pieces of miniature Art In Wax on three continents now. It can be a challenge working in miniature but I love to see just what I can do in the wax and I do love a challenge. This weekend we did our 3rd ever Miniature Fair in the Leisure Center Felixstowe in Suffolk. We had been to a fair here before as a visitor when buying things for my 1:12 Art Gallery. But the first time selling my Art In Wax. We had a great day, met lots of lovely people both the stall holders and the visitors and I was in my element talking about my Art and about miniatures in general. We also sold lots of mini Art In Wax too !!!! The fairs have a wide variety of miniatures on offer, everything you could wish for your your Dolls House or Miniature scene. I had a great time looking at the stands and talking to the other exhibitors, such as Sandra from Sandra’s Miniatures and Louise of Dinky Delights who makes some wonderful accessories a couple of which are in The Gallery. I am an artist and I paint in many sizes, and all my paintings are original and unique. Some maybe of similar subjects, I do love to paint flowers and landscapes, but each is different and special, be it a large A3 piece or a tiny 1 inch square mini picture. 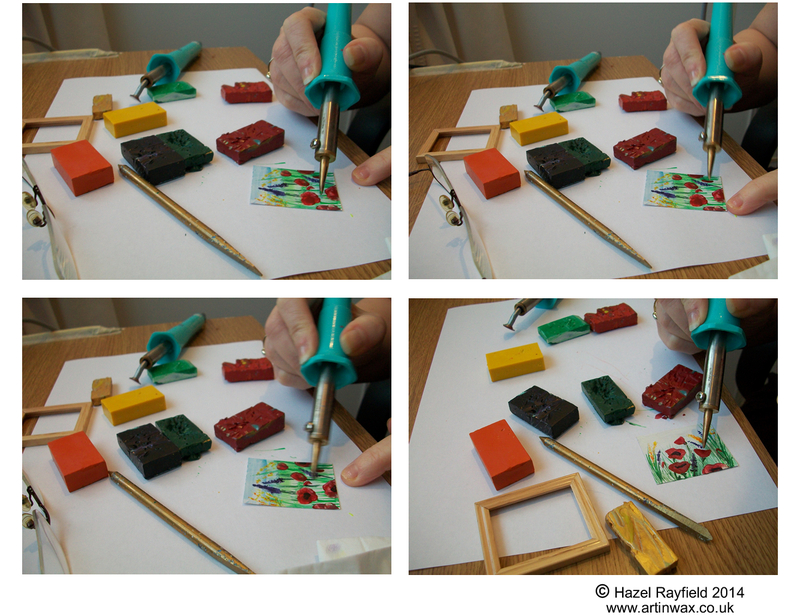 These pictures are of me painting a tiny miniature painting using my Encaustic wax and a heat tool called a stylus, which is purpose made heat tool, for encaustic wax painting, I have several of these tools with different nibs, some which I have bought and others my clever husband Adrian has made for me in order that I can paint even finer and get more detail into my miniatures. Some photos from the Felixstowe Dolls House and Miniature Fair this weekend. 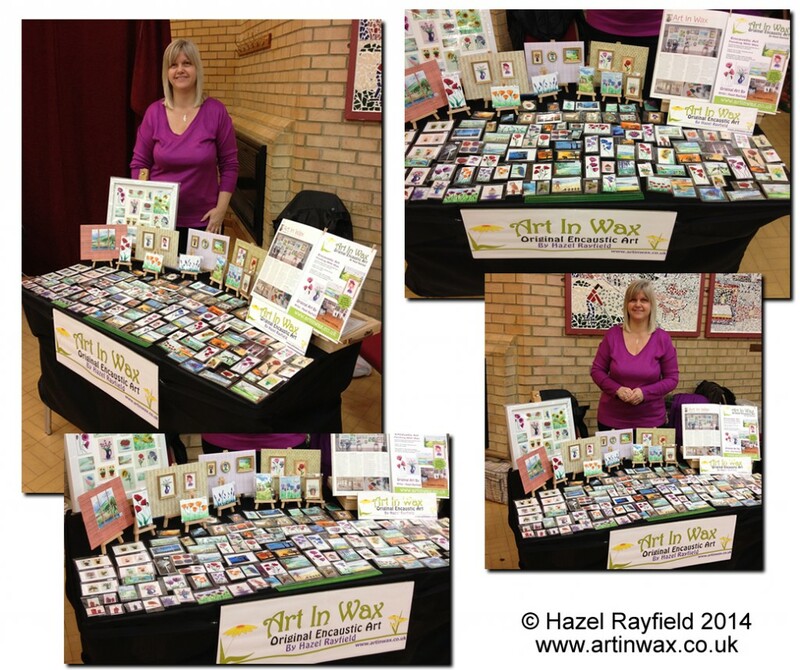 We will be doing more fairs in 2015 why not like the Art In Wax Facebook Page : Art In Wax Facebook page www.facebook.com/artinwax as I will be posting the events we will be attending on there as and when. 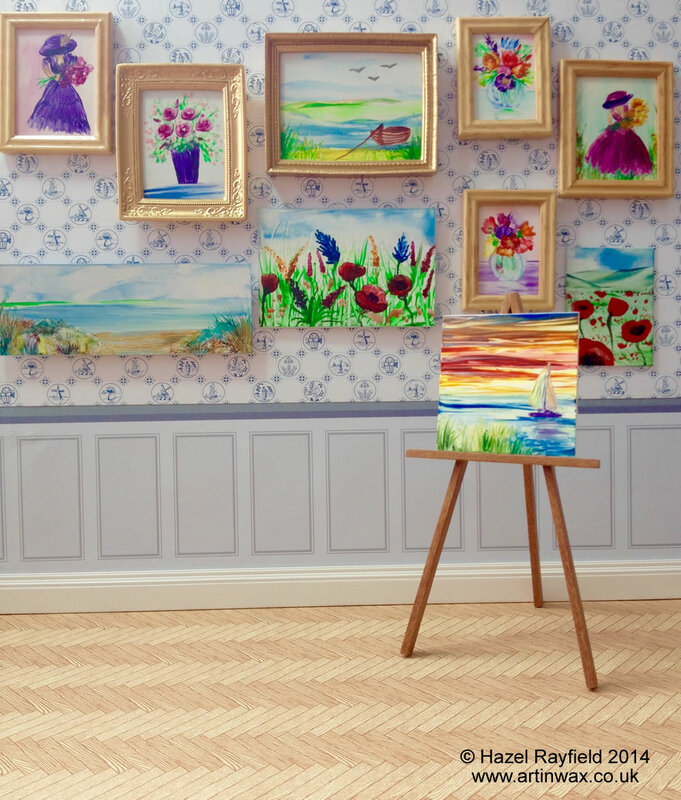 Owning Miniature Art – Not just for Dolls Houses ! Miniature Art is great for dolls houses, having a piece of original art is very special. But Art In Wax miniatures are not just for dolls houses or ACEO collectors. They are just great to own as a original piece of Art. You can buy Art In Wax in all sizes online via Art In Wax website Shop or in my outlet shops on Etsy and Folksy all the shops have unique pieces no two places have the same pictures so lots of choice. Miniature Art In Wax via EtsyI ship worldwide.